In celebration of Halloween and the beautiful leaves, I thought I'd share the recipe for one of my favorite autumn desserts. In our family, it takes a place of honor next to the pumpkin pie at Thanksgiving dinner (and sometimes Christmas, too). Preheat oven to 375 degrees Fahrenheit. Beat the eggs on high speed for five minutes, then gradually beat in sugar. Stir in pumpkin and lemon juice, then fold in flour, baking powder, cinnamon, ginger, nutmeg and salt. Spread in a greased and floured jelly roll pan. Top with walnuts. Bake for 15 minutes then turn out onto a towel that has been sprinkled with powdered sugar. Roll in towel and cool. In the meantime, make filling by beating powdered sugar, cream cheese, butter and vanilla until smooth. When cake is cool, unroll it, spread with filling and re-roll. It's not unusual for the cake to crack slightly. Keep a little extra filling aside to fill in the ends of the cake roll and any large cracks. Chill for 3-4 hours or overnight before serving. I haven't made this or pumpkin pie yet this year, but I'm looking forward to them both. Let me know if you try either of my recipes! It was SO wonderful to have a three-day weekend! I desperately needed the extra day to get things done, refocus and rest. On Friday, I got up and went to a 6:15 a.m. yoga class. I was still quite sore from Wednesday's class, but I don't think I slacked off all that much. I can't stand the sight of myself in the mirrors and I don't remember sweating so profusely during class in the past, but otherwise it seems to be going well considering how many years it's been since I last attended classes regularly. Later that morning, the dermatologist took a divot out of my upper arm to remove a mole that looked too dark and square for her liking. It stings a little now and then, but I think I'm going to make it. I spent the rest of the day doing whatever I wanted to do. While I was driving around, I managed to compose the final lyrics to one of the songs I've been trying to complete for months. Woohoo! I stopped by Costco and bought "Magical Thinking" by Augusten Burroughs to read while I was getting a pedicure and having my hair colored. It was hilarious and I highly recommend it. After I read Pajiba's review of the movie of Burroughs' "Running With Scissors," which said that the book was much better, I bought that book, too. Speaking of being influenced by reviewers, I recently read "Television Without Pity: 752 Things We Love to Hate (and Hate to Love) about TV." One of the shows that the authors kept praising was "Clone High," an animated show I'd never heard of. After I finished the book, I ordered the first season of "Clone High" and received it last week. Hubby and I watched an episode before we went out on Saturday and it was just as entertaining as Wing Chun and Sars said it would be. It's definitely not for the kiddies, but quite funny! When I wasn't reading, I spent my weekend getting costume accoutrements so my husband and I looked like proper goth folk on Saturday night. It was kind of fun to wear as much eye makeup as I could layer on. We went to two parties on Saturday and still made it home before midnight. We're very lame. I'm still wearing my black fingernail polish, just 'cause I can. I'll let it go after the last of the trick-or-treaters comes through tomorrow evening. I don't have a lot of time this morning, so I decided to steal this meme from Megan at Divine Reality. You may wish to do the same! ...is stuck in my head. Whatcha doin' this fine weekend? "Silence of the Lambs" is probably the scariest movie I've seen as an adult. That scene in the killer's basement was so intense the first time I saw it that it took me about 20 minutes for my heart rate to slow down once the movie was over. Hmm, now that I have the show "Heroes" to give me new superpower ideas, I guess I'll have to say, "Manipulating time and space." I can't remember - I haven't commented anywhere since yesterday. I have the day off today, so my weekend has already started. I'm going to the dermatologist (fun! ), having lunch with my dad, getting a pedicure, having my hair cut and colored, and doing some vocal recording tonight. Tomorrow I have a community service committee meeting, then some last-minute Halloween costume shopping and a couple of parties to go to (my husband and I are dressing as if we're in a goth band). On Sunday, I'm babysitting my niece and nephew so my sister and brother-in-law can go to the Chiefs game. Yeah, it turns out I have a LOT of different muscles in my body. Many of them hurt today, particularly the upper body ones that are accustomed to a default posture of "crouching toward the computer keyboard like a gargoyle." So anyway, I continued my self-improvement theme yesterday by making an appointment to get my hair cut and colored, arranging for the septic tank guys to come and clean out the tank today (before I leave for work, I need to remember to plant a stick in the ground so they'll know where to dig), and leaving a message for an electrician who was recommended to me by both my dad and one of my husband's friends. I even tried to be good about what I ate yesterday. At lunch, instead of my usual Italian sub with vinegar and oil, I had turkey breast on wheat bread with mustard at Subway. I even brought an apple and had it instead of chips. The smug glow of nutritional superiority couldn't survive dinner, though. I went to a friend's house and there was quiche, baked brie with brown sugar and pecans (heavenly! ), a frightening number of savory dips with equally savory crackers, and lots of red wine. I brought Rabid Red, which I'll admit I chose mainly for the label, although the liquor store guy said it was good (and it was). Oh well, at least I'm moving away from pigging out all day long. It's a start. So that's my progress for one day: many steps forward and a couple steps back. It'll do. Yesterday I had a long-overdue deep tissue massage. As I was paying and chatting with my massage therapist, she told me what I already knew: my muscles were a mess - even worse than usual. I clench my jaw, I sit in front of a computer way too much and I don't get any exercise, so by the time I finally limp to the chiropractor or massage therapist, I'm always reduced to a painful mass of tight muscle fibers. Her advice: get a night guard from the dentist, start taking yoga again and increase my calcium and magnesium intake. I'd already been considering resuming yoga classes, partly for the strength and flexibility and partly because I'm noticeably gaining weight. Last night I looked up the class schedule for the yoga center in my neighborhood and saw that they had a Level 2 Ashtanga class at 6:15 a.m. on Wednesdays. I set my alarm for 5:45 a.m. I woke up before the alarm rang and repeatedly talked myself in and out of going to the class until I got up. It's been a couple of years since I last took a class and I was worried that I couldn't hack an advanced class. But then I figured that "advanced" just meant "for students who already know the classic poses." Anyway, I got up at 5:45, threw on some hideous workout garb that exposed my pudgy midsection way more than I would have liked, and went to class. I almost bailed out at the 15-minute mark. I started feeling nauseated and a little clammy, but I sipped a little bit of water and forged onward. I couldn't do some of the advanced poses, but I made it through the whole 90-minute class and even managed one handstand (against the wall, but still...). When the class was over I felt WONDERFUL. After my shower, I continued the self-improvement juggernaut and called my dentist's office to make an appointment to be fitted for a night guard. Then I retrieved my container of Viactiv from the back of the cupboard, dosed myself with calcium and headed to work. Now, I'm not saying I'll be able to continue my progress indefinitely, but it sure feels good to have gotten this far. I'm planning on taking yoga classes every Monday, Wednesday and Friday morning and I should be able to settle into the routine after a week or so. Wish me luck! I am going to ask for help with one of my favorite projects. Women for Women International is a sponsorship organization that started in Bosnia and spread to other war-torn areas of the world. For $27 a month, you get matched with a woman somewhere in the world who needs help. You support her and send her letters while she goes through a structured program to get back on her feet. If you are lucky, you may get letters back. The organization provides the translation services. My goal is to convince 10 women to become sponsors before the end of the year. Please let me know if you decide to sponsor. Even if you can't afford to do that, please consider a link over here to help me and these women out. I belong to Soroptimist International, which is associated with this group, but my particular club is pretty focused on helping local women. This seemed like the perfect chance to branch out and help someone who can really benefit from an amount of money that I can save by foregoing a daily Red Bull from the vending machine at work. I signed up immediately. If you decide to participate, let SueBob know. On Friday night, my niece came to our house for a sleepover. She's six-and-a-half and, as my sister puts it, behaves pretty much "like a real person" in social situations now. My husband and I took her to dinner at Red Robin and did our best to tune out the deafening din of the other patrons. Even my niece said, "Those kids are loud!" After dinner, we went to the grocery store to stock up on junk food (Chips Ahoy and mint chocolate Dibs) and then on to Blockbuster to get a movie to finish out the night's activities. My niece was immediately torn between "Barbie and the 12 Dancing Princesses" and a Bratz movie. "Hey, let's see what else they have!" I said. "How about 'Wallace and Gromit?'" We walked down both aisles of the Family section but nothing had more appeal than the cheesy doll tie-ins. I could see that I would only have enough influence to steer her toward the lesser of the two evils. We brought home the "Barbie" movie. The next day, we got up early and went to breakfast. After that, my niece put on her "Hollywood starlet" Halloween costume and we went to a nursing home to join my community service organization in throwing a party for the residents. We finished the morning's activities with an early lunch at a nearby cafe. The service was dreadfully slow, but my niece behaved like a perfect little lady, chatting with the other club members and hardly fidgeting at all when it took forever for the food to arrive. On the way home, we got into a conversation about how different things were when I was a kid compared to now. She could hardly believe that we only had ONE television when I was little, and that it was black and white. When it came time to drop her off at home, she thanked me for a fun weekend without any prompting from her father. We definitely need to hang out together more often. I'm Friday catblogging again as I try to recover from staying up past my bedtime seeing Dweezil Zappa and the amazing band he put together to play Frank Zappa's music. Even without guest players Steve Vai and Terry Bozzio, it would have been fantastic. 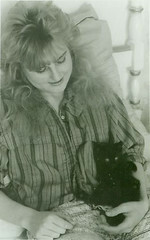 This photo shows my cat, Kato, when I got him in early 1990. He'll turn 17 in December and he's still quite playful. Just try to tie your shoes in his presence and you'll see what I mean. Because of his age, he's our most high-maintenance cat. He gets 1/4 of a Prilosec tablet every day to maintain his appetite despite some kidney problems. Then he gets special canned food and special dry food that the other cats would desperately like to take away from him. I wish I still looked that young...although I'm well rid of the giant, blonde mullet and the acid-washed jeans! What that means is that if every one of 110 million American households bought just one ice-cream-cone bulb, took it home, and screwed it in the place of an ordinary 60-watt bulb, the energy saved would be enough to power a city of 1.5 million people. One bulb swapped out, enough electricity saved to power all the homes in Delaware and Rhode Island. In terms of oil not burned, or greenhouse gases not exhausted into the atmosphere, one bulb is equivalent to taking 1.3 million cars off the roads. I've been replacing the light bulbs in my house with compact fluorescents since late last year and I can report that they're amazing. The light is just as strong and steady as you'd expect from an incandescent bulb. Best of all, not a single one of them has burned out since I started using them. I used to go through ridiculous numbers of regular lightbulbs. The latest lightbulb advance to catch my eye is this LED spotlight. I need to replace both spotlights on the side of my garage and even though these are extremely expensive, they're supposed to last 10 years and cost only $4.00 per year in energy. That's a pretty compelling argument. The way energy prices have been fluctuating, it's a little difficult to tell how much effect the fluorescent bulbs are having on my electric bill. We keep quite a few lights on all the time, and my sense is that our bills are lower than they would be with the standard bulbs. Do you have any energy-saving tips to pass along? That's right, it's "Slept Too Late Wednesday" again, so you get another list post. I'm trying to flex my daily blogging muscles to participate in Eden Kennedy's NaBloPoMo, which is much more likely to be possible for me than another abortive, non-attempt at NaNoWriMo. New Seven Wonders - This site seeks to update the Seven Wonders of the World list and invites you to vote for your seven choices. The AntiCraft - Needlework, knitting and other crafting for the more rebellious among us. For example, there's an article about knitting with wire (ouch!) and a pattern for a knitted tea cozy adorned with deadly nightshade blossoms and berries. Haunted When it Rains - A collection of Victorian post-mortem photographs. It sounds creepy, but when I look at the photos, I can see why people found them comforting. Jewels, Ink and Feathers is a freaky little animated short that's like the dark side of a children's picture book. Zappa Plays Zappa - Dweezil Zappa is out on tour playing Frank Zappa compositions and I have tickets to see it tomorrow night. I can't wait! Okay, that's all for now. Have a great Wednesday!